What can I do to improve my fuel economy? There are actually a lot of things Lovell drivers can do – some of them are pretty easy. One of the first things is make sure their tires are properly inflated. On the inside of the driver's door or door jamb is a plate that indicates the correct tire pressure. Careful – there might be a different pressure for the front and rear tires. Check them at least once a month. Carrying extra weight in the vehicle hurts . Leave unnecessary stuff home. Do we even need to mention driving fast around Lovell and jackrabbit starts? 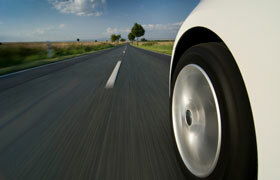 Gently accelerate and plan your stops so that you can ease into them a bit. This really makes a big difference. Now there are a number of maintenance items that improve fuel economy for Lovell drivers. Lubricants should be replaced on schedule – dirty oil, transmission fluid and differential fluid cause more friction and drag which hurt . A big one is having a fuel system cleaning done if needed. A dirty fuel system can really reduce engine efficiency and increase fuel consumption. And if your Check Engine light is on, take your vehicle in to Thurstons Garage in Lovell for a diagnosis. Some conditions that trigger the light can really hurt your fuel economy. Getting the necessary work done to correct the fault will help your engine run better and may bump up your fuel economy. And watch out for miracle cures. There are a lot of products being sold in ME that claim to increase fuel economy. Check them out before you buy. Ask your friendly and knowledgeable pros at Thurstons Garage for ideas to improve your vehicle's fuel economy.